2015 Speed 94R, warped front discs, only slightly noticeable when almost stopped. Claimed at 12 months old and accepted without hassle via Triumph Plymouth. A few weeks delay due to lack of stock at Triumph. New discs and pads fitted without problem. 2012 Speed cracked headlights replaced. I think the bike was about 2 years old at the time,Hughenden M40 replaced them with no quibbles. glass in both mirrors vibrating as glue came loose. Made buzz louder than the exhaust. Replaced under warranty. 2015 speed 94, heel knob on kickstand snapped off. Replaced kickstand at Woburn, no issues. Is that it?? Have a look at bmw r nine t forum it's what made my mind up about getting a speed next year!! Same on the Multistrada forum, thankfully I have no further interest there. I think generally speaking Triumph's are fairly reliable and well put together, although there's always the odd Friday afternoon bike and it seems a bit hit & miss as to whether Triumph give good after sales support. Couldn't get used to the lack of whinging when I moved forums ....people pass the time cracking jokes for god's sake!!! My mate has a 2014 speedy se, his headlights have bubbled/blistered. Anyone had any issue with this? You wouldn't need as many cushions to sit on as you would in a Range Rover. Plus you could buy a Triumph or two with the huge pile of cash you'd save! Anything non standard? e.g. high watt bulbs or perspex stone guards? Seem to remember something in handbook of my Sprint or Multistrada about not running lights on and taped up for track days. Don't recall same warning in Speed3 though. Hi I'm new to this forum but i would like to know if anyone else have had issues with their headlights melting when using headlight protectors. I have spoken to Triumph but they say there is not an issue with the headlights. If the protectors are a genuine Triumph part number accessory or Triumph approved accessory then you will have a case, if not you are probably on your own, I doubt if Triumph would accept liability, they will wiggle out of it unfortunately mate. There is possibly another course of action, against the supplier of the the head lamp protectors if there is no warning of damage that may occur, you should expect the item(s) to work with out damage to the machine, 'not fit for the purpose they were sold'. The Seller would be the customers first port of call. I contacted Bevans of Cardiff re slight warp in front discs on 2014 ST with under 5k on clock. The bike was bought from CMC, Newport and was serviced by them on sale with 1500 miles. Despite the bike being 2 years and 4 months old I thought I'd try and appeal to triumph's better nature due to low miles, age, safety. Bevans told me that because the bike was serviced by CMC Triumph would not entertain any warranty. I then stated that he had just provided me with no reason to ever pay for main dealer servicing again for the life of the bike! I've had a search on the Triumph web site, their general contact phone number is +44 (0) 1455 251700, another forum member might come up with a better contact no. for you. 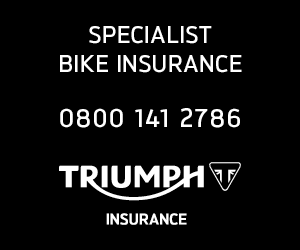 In the first instance we ask that you contact your Triumph-authorised dealer directly. If you have done this and your dealer has not been able to help you, please email [email protected], outlining the nature of the problem and quoting the last 6 digits of your motorcycle Vehicle Identification Number (VIN) (frame number) and the name of the dealer you have visited (we regret no action can be taken regarding warranty unless your motorcycle has been inspected by an authorised Triumph dealership)." So you might get a better response by email in the first instance. 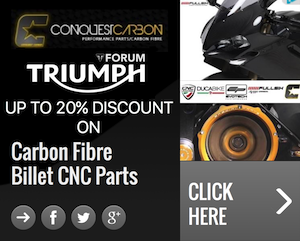 Triumph obviously do what they can to protect their dealerships and "persuade" owners to give them their custom. It's not clear from your post how old the bike was when you bought from CMC (with their service), as long as you have the 600mile, 1st and 2nd year services stamped up by a Triumph dealer then you should get a response from Triumph. Unfortunately in my experience all bike manufacturers seem hit and miss with "good will" gestures outside of warranty (I sold my Multistrada because Ducati were uncooperative just weeks out of warranty). Without an existing relationship with your Triumph dealer and them fighting your case unfortunately I think your chances are not good.